Welcome to a new series within the blog, these posts are all about getting me, the resident naturopath and nutritionist, running again and (for the first time ever) running correctly and pain free. I’m a little bit scared and excited about what I’ve got myself in to here, and that confirms for me that this little journey is something worth doing. I’m so keen to be able to run I can’t begin to tell you (but I’m going to try)! I’ve always had wonky biomechanics. Although always pretty active I have a long history of knee, back, hip, wrist and elbow problems. In college I developed severe shin splints, spent months (?years) going to old school pyshio’s and sports doctors, had painful treatments, took anti-inflammatories and was hooked up with cortisone patches (I’ve learnt a lot since then!). All which did about nothing. Years later I went to see an osteopath who changed my life. After one treatment on my hips and lower back I was finally able to run again – albeit only a short distance – but it felt nothing less than a miracle to me. I’d still get tight anterior tibialis (shins) when running, and if they really started hurting again I knew I just needed to go back and get another treatment for my hips. I then got back into hiking again, but found I would get niggly pains in hips and knees, and then one day, in 2007 a little slip down a boulder during a hike resulted in my fibula head partially dislodging and I had another day and a half of walking steep terrain to get back to our car. I haven’t run more than a couple hundred metres or been hiking (overnight) since. Not being able to go hiking was a huge blow as that was something I loved to do to feed my soul and keep me sane. Before moving to Wellington I had a great trainer in Sydney who introduced me to Vibram Five Fingers and that has certainly made a world of difference to me. My biomechanics just don’t like me wearing shoes. 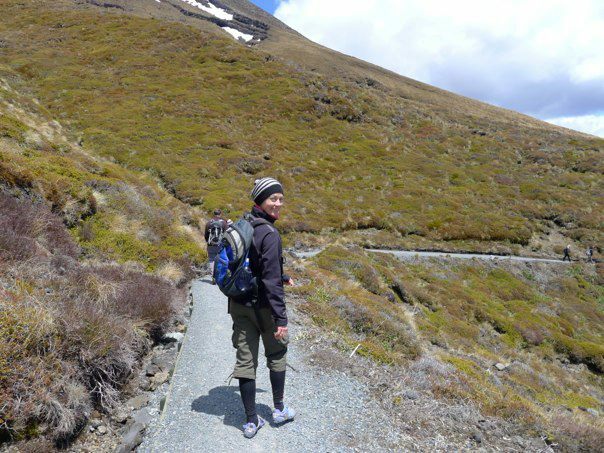 With five fingers I’ve done loads of walking and some intermittent short (100-200m) runs throughout my walks up Mount Vic and last November even managed to walk the Tongariro Crossing. Going up was no problem and it was only the last 6.4km going down that was painful. Even so, I was excited that I managed that distance. My leg is better than it was 5 years ago, but certainly not good enough to do any overnight hikes or get into rugged areas. I’ve dreamt of visiting the Himalayas for so many years, and on a recent trip to India and Nepal I had a close encounter that was both inspiring and heartbreaking. Inspiring because of the sheer magnificence of the mountains. Heart breaking because I knew I wasn’t in condition to do even one of the more basic treks in the area. So now I have a new resolve – to be able to revisit the Himalaya (next year) and, instead of looking wistfully at the ranges, to find myself in them (and able to get out). And I want to run – the simple, primal activity that we are engineered for. Just like hiking into wild areas, there is something very liberating about going for a run. So I’d like to do a 10km run by the end of the year, and am looking forward to getting my fitness back (I think this aspect is one of the bits I’m scared about – I’ll soon be finding out – as will you – just how unfit I am!!). I’m grateful to be working with physio’s Gayle, Nick, Grant (of Willis Street Physiotherapy) and trainer Carl (Hammington) . Very unlike phsyio’s of my previous experiences this crew really look at the big picture and are able to see where the problem is coming from rather than just isolating the treatment to the area of the pain. As for Carl, he’s not your average trainer either. He has a wealth of experience and knowledge in the fitness arena and, like myself, loves real food and is no stranger to bone broths and fermented veggies. Hopefully this blog will help inspire some of you out there – whether you’ve been sitting on the injury bench or the couch for too long or you feel you could improve your running form to reduce your chance of injury and improve your performance. I’m willing to embarrass myself with an honest account of the journey for your benefit, so come join me! Now for the first steps – an assessment with Gayle and an assessment with Carl…. Here we go!